In December 1888 the news about Messrs. O'Meara and Dillon as Propaganda Agents in Ireland, was already knew. There is an article published in "The Souther Cross" (that also mention a similar one the other newspaper "The Standard") that has a very interesting reflexion. This was the starting kick for the formation in Buenos Aires of a special Committee that could handle the large batch of immigrants coming from the British Isles. There is a second article published a month and a half later that speaks about the formation of the "British Immigrant Committee" and the resume of that first meeting. Hope you like it! We are glad to learn that our E.C. 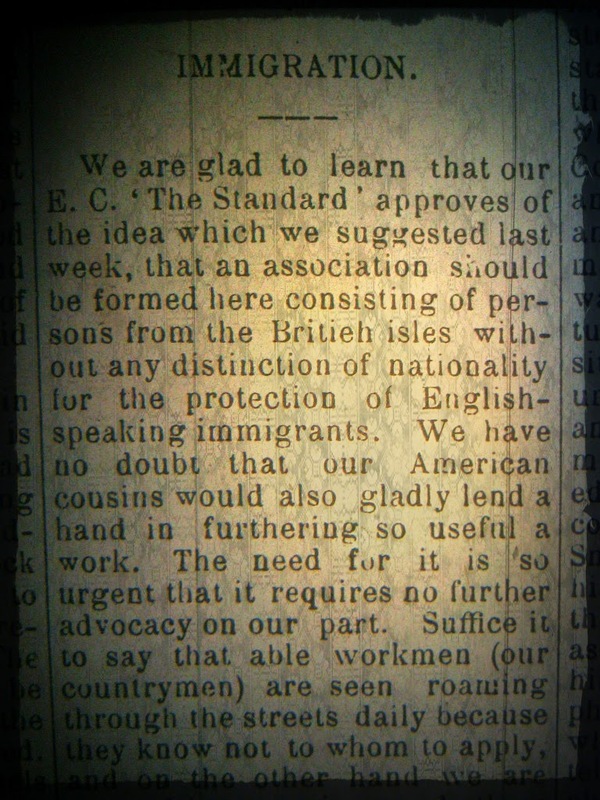 “The Standard” approves of the idea which we suggested last week that an association should be formed here consisting of persons from the British Isles without any distinction of English-speaking immigrants. We have no doubt that our American cousins would also gladly lend a hand in furthering so useful a work. The need for it is so urgent that it requires no further advocacy on our part. Suffice it to say that able workmen (our countrymen) are seen roaming through the streets daily because know not to whom to apply, and on the other hand we are assured by estancieros and others residing in the camp that the are in want of honest men and would pay them good wages. With regard to the wicked project of O’Meara and Dillon to send poor families adrift on these shores without any guidance or protection, we shall repeat here the words of our Rosario correspondent who is a true Argentine patriot: “You cannot say too much to discourage the coming here of Irish families on speculation, unless they have capital to enable them to start on an independent flooting. I have heard of several very sad cases lately, of people who have been induced through false representations made by unscrupulous, or ignorant agents to leave comfortable homes in the United States and to come here, or to Cordoba to live on starvation wages, and to deny themselves every comfort they have been accustomed to. One case in particular was very sad; a family went up to Cordoba under circumstances I have mentioned. Finally we do not at all object to the suggestion made by the Standard that something should be done to unite the English-speaking people of Buenos Aires for their mutual benefit. We can be of use to one another in many ways while we still adhere to our opinions with respect to the national rights of our respective countries. Notice | A meeting will be held this day at 3 o’clock pm at the office of Messrs S. B. Hale and Co., No 50 Calle Reconquista, (new number) to consider the best measures to adopt for providing for the 1000 Irish emigrants expected to arrive today in Montevideo in S.S. Dresden. All who sympathize with the object of the meeting are respectfully invited to attend. Buenos Ayres, Feb. 11th 1889. A meeting was held yesterday at the office of Mesrs Samuel B. Hale & Co. with the object of considering the best course to pursue to afford every possible accommodation to the Irish Immigrants about to arrive by the SS Dresden. Mr. Casey was unanimously voted President and Mr. John Drysdale Vice President, who owing to Mr. Casey’s absence took the chair, Mr. F. H. Mulhall was named Secretary. We notice amongst those presents the following gentelmen: Michael Dinneen, Guillermo Walton, Williams, J W Reade, Thomas Duggan, Douglas Darkin, Eduardo Kenny, Miguel J. Byrne, Maurice Fleming, S. Lyndon Owen, Rev. F. Constantine, N.T. Rider Hancock, Rev. Eugene Ryan C.P., Samuel G. O’Farrell, C.H. Sanford, David Methven, Samuel Johnston, J. Mohr Bell, Michael Hearne, Edward J. Byrne, Pedro A. Connor, Hugh Nelson, John O’Connor, David A. Gartland, Ing Jes Smith, J.M. Conelly, John Nelson, John F. Pearson, F. H. Mulally, R.M. Runciman, R.A. Norton, J. M. Mulhall, Eduardo T. Mulhall, John Drysdale, Chas. Clarke, Francis A. Bowen . The chairman, in opening the proceedings said that he was glad to see such a large attendance of the principal merchants and bankers of this city and estancieros of the province. The immigrants would be here in a few days, and the object of the meeting was to see how they could be best cared for -they should be well received and, if possible, provided with situationism and he was sure that those present would do everything in their power to encourage the English speaking immigrant- everybody would be willing to assist in this good work and privude employment for the new comers. Father Gaughren stated that Mr. Gartland had offered to take over five hundred familis and settle them on his lands near Bahia Blanca, giving each family forty squares of land, and means of subsistence to the amount of 1000 m/n per family, charging interest at the rate of 9% per annum. This would include the cost of management of the colony, and he would allow the colonists from ten to 12 years for reimbursement. He would open a store on the colony, provided with all necessaries for the settlers. He was willing to withdraw his proposal should a more favourable one be offered. 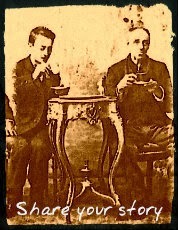 He was merely prompted by a wish to benefit the emigrants. Mr. M. Dinneen, Editor of the Southern Cross, said that this proposal should be receive full consideration. He, therefore, proposed that a sub-committee be appointed and that some gentleman should be nominated to see whether the land was suitable for farming. Mr. Jonstone, the well-known shipbroker , stated that the Irish Immigrants of the Dresden were in charge of the Head of the Immigration Department, Mr. Samuel Navarro. He added that this was the largest consignment of immigrants from the north ever sent to this country. Minister Quirno Costa, he knew, was anxious to do all in his power to help the new arrivals, but it was expedient that some gentleman should superintend their treatment at the Emigrant’s home, and provide for their separation from Italian arrivals. Dear Mulhall, I see your name attached to a notice calling a meeting to concert measures to find employment for a large number of expected British Immigrants. I should like to have attended, but the shortness of the notice and the necessity of sitting on a Commission to take evidence in a lawsuit pending in England prevents my doing so. Last week I interviewed Mr. Sundblad , the Comisario General de Inmigracion and he did not appear to apprehend difficulty in treating the new arrivals. I mentioned the formation of a British Immigration Aid Society had been mooted, and he expressed his opinion that the need did not exist, as the Argentine Government lauded, housed, fed and sent to destination, all free of charge, any new arrivals. Doubtless, however, he will be glad to cooperate with any Committee which may be formed. He showed me the Asilo, and as I was there at dinner-time, I had the opportunity of seeing the food, which was excellent and plentiful. The sleeping accommodation appeared good, due regard being paid to the separation of the sexes. Married people had rooms apart. While you were at Committee I wrote a notice for The Standard calling upon all those who had land to offer or who wished to give sheep on shares to make known their requirements to Mr. Sundblad at the Immigration Department. There is an Infirmary at the Asilo, but as many of the arrivals may prefer treatment at the British Hospital. I have already written to the Hon. Secretary enquiring how many beds are vacant. Mr. Dinneen then asked that an interpreter be appointed to give the immigrants information about the country and state their requirements. Mr. E.T. Mulhall, Editor of the Standard, proposed the formation of the following sub-committe: Lord Mayor Cranwell , Father Constantine, Mr. John Drysdale, Mr. M. Dinneen, Father Gaughan, Mr. F. Mulhall, Mr. David Methven. Mr. Thomas Duggan suggested that all proposals for accommodation of the immigrants be submitted to the above sub-committee as well as look after them on their arrival. Mr. Christie stated that he would be happy to give employment to a few families. At this juncture, it was stated that Minister Quirno was ready to give employment to 20 or 30 adults, start them at 20 dollars per month, all found, on his estancia. A letter from Mr. Smart (1) was read, offering employment to all tailors among the arrivals. Mr. Bowen, the well-known capitalist, thought that Mr. Gartland’s proposal deserved serious consideration, as it involved, so to say, the creation of a bank with a capital of $400.000, the care-taking of thousands people, and the foundation of a distrinctive Irish colony. The people, he said, were not dropped in a wilderness, and authorities were near to redress any grievances. In the vicinity of a market, so to say, independent of a railway, they could cart their own produce. A committee should be appointed to get the very best terms for the people and by all means to found an Irish Colony. Mr Sewell, be stated, had offered to proceed to Mr. Gartland’s estate and report thereon. Mr. Sundlad had offered to suplly 250 tents until the immigrants put up wooden houses, and Father Gaughan voluntared to accompany them as chaplain. Mr. Runciman thought that if this proposal were accepted the immigrants would be in very good hands, and Mr. E. T. Mulhall suggested that in case of sickness the patients should be sent to the British Hospital. Mr. Francis Mulhall, Mr. Dinneen, and Father Gaughan stated they would have much pleasure in going to Montevideo to meet the immigrants. Mr. C. H. Sanford, of the firm Samuel B. Hale & Co., said that he was very much pleased at the proposal to these gentlemen to go to Montevideo, as it would afford an excellent opportunity (…) the feelings and expectations of the emigrants. The proceedings then terminated, Mr. Runciman proposing a vote of thanks to Mr. Gartland, which was likewise unanimously carried. Votes of thanks then followed to the Chairman and Messrs S. B. Hale and Co. for placing their offices at the disposal of the association. The proceedings of the meeting were taken down by Mr. Robert Keogh, to whose services we are indebted for the above minute report.